ST. GEORGE – While the number of fatal drownings in pools involving children is estimated to be significantly down since 2010, according to a recent report, drowning is still the leading cause of unintentional death among children 1–4 years old. A recent incident in St. George that could’ve turned out much worse highlights the need for increased awareness. With Memorial Day weekend marking the traditional start of the summer swim season, parents and others are asked to be mindful of swimming safety, particularly where young children are concerned. A new report released by the U.S. Consumer Product Safety Commission Tuesday shows that the number of reported fatal child drownings in swimming pools involving children younger than 5 – the most vulnerable population – has decreased 17 percent nationwide since 2010. Despite the decrease, fatal and near-fatal child drownings in pools and spas continue to pose a public health challenge across the United States, according to the CPSC report. “Despite the positive decline in numbers, there are still far too many children who drown each year in pools and spas across the country,” Ann Marie Buerkle, CPSC acting chairman, said Tuesday. Earlier this week a 2-year-old boy fell into a swimming pool at his home, St. George Police Officer Lona Trombley said Wednesday. No additional details were provided concerning this particular incident. However, many incidents involving toddlers tend to be connected to what the health department describes as “under-supervision,” such as when there is a family gathering and there is no designated child-watcher, according to the Utah Department of Health website. Others may also think someone else it keeping tabs on the child and not think much of it. In other cases the child was thought to have been indoors and actually slipped out. This can lead to the child wandering over to a pool or other body of water and falling in. “Drowning can happen even when a child is being supervised,” according to the Health Department website. Eyes glassy and empty, unable to focus or closed. Vertical in water – not using legs. Trying to roll over on the back or trying to swim but not making headway. Have a proper fence that secures the pool. Ensure your children know how to swim, either with private or public swimming lessons. It is an inexpensive skill that may save your child’s life or someone else. Don’t assume children who can swim can’t drown. They still need constant supervision. At large gatherings, designate one person as the pool watcher so all adults don’t assume someone else is doing it. Don’t allow young children to play near a pool without supervision. Don’t use flotation devices as supervision. Make sure all babysitters are qualified with CPR and pool safety tips. Leave rescue equipment near the pool area, as well as a phone for calling 911 in case of emergency. Remove toys from pool area when not in use. 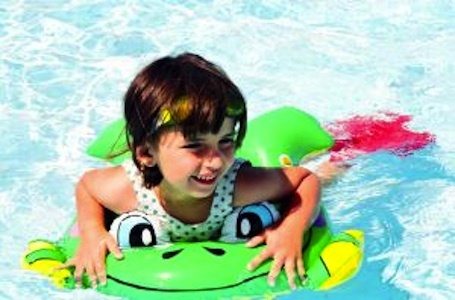 Toys can attract young children to the pool. Never prop open the gate to a pool. Use locking spa covers on pools and hot tubs. A lesser known fact is that near-drowning or secondary drowning victims need immediate medical attention because accumulation of water in lungs – irrespective of the amount – can cause constant fluid accumulation, which is fatal. Every near-drowning victim should be checked by a healthcare personnel, and this goes for a person who has been revived. Sometimes, near-drowning victims show symptoms including vomiting, restlessness, confusion, chest ache, pale appearance of the victim, cold skin, bluish skin – mostly around the victim’s lips – abdominal distention, unconsciousness, lack of breathing, lethargy and coughing froth. Other times, they may appear to be breathing fine and show no symptoms at all and then later die. Time is of the essence in these situations; do not wait. It is crucial to get a near-drowning victim to a medical professional immediately. CPSC’s latest data shows there were 346 reported fatal child drownings in pools and spas in 2014 involving children younger than 15, compared to 397 reported fatal drownings in 2010 — a 13 percent decrease. Of the 346 reported fatal child drownings in 2014, 252 involved children younger than 5. This is a 17 percent decline when compared to 302 fatal drownings involving children younger than 5 in 2010. Between 2012 and 2014, the majority (77 percent) of reported fatal drowning victims younger than 15 were younger than 5 of which two-thirds (66 percent) were male. For 2014 through 2016, an estimated average of 5,900 children younger than 15 years old were reported as being treated in hospital emergency rooms for non-fatal drowning injuries in pools or spas. Between 2014 and 2016, the majority (74 percent) of children treated in emergency departments for pool- or spa-related, non-fatal drowning injuries were younger than 5 years of age. For more information regarding the prevention of child drownings and drain entrapments in and around pools and spas visit PoolSafely.gov. St. George News reporter Kimberly Scott contributed to this article.